A novel of compassion and insight, Good Luck With That tells the story of two women who learn to embrace themselves just the way they are. 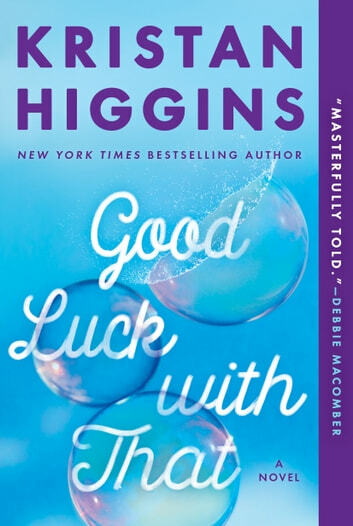 Kristan Higgins posted a blog late last night announcing the release of her latest book, Good Luck with That. She explained some reasons she wrote it and described the book a little. And Kristan ended with this, “I hope GOOD LUCK WITH THAT breaks your heart and puts it back together, stronger than ever, full of resolve to take care of yourself in every way that counts. I hope you love this book, ugly-face cry while reading it, laugh out loud while reading it and close it at the end with a glow in your soul because you felt it all the way down to your bone marrow. I hope that with all my heart.” This is what she wanted to do for us – her readers who struggle each and every day, who have struggled for years, just like Emerson, Marley and Georgia. Well, this amazing, fantastic, terrific, marvelous, pick one glowing adjective book does that. It does all of that. She has succeeded 100, no, 1000 per cent. With this blog, she has written her own book review! When I finished reading my advanced copy of GOOD LUCK WITH THAT a couple of nights ago, before she posted her blog, this is what I posted on FB: “Dinner was a little late tonight because I could not put down my ARC of GOOD LUCK WITH THAT!  I see that Kristan has put 'laugh - cry - laugh again' at the top of this web page. That is exactly what you'll do when you read this book. Have the tissues ready and be prepared to laugh out loud. And to have your heart feel so full it will nearly burst. Can you tell I loved this book? Yay, Kristan!” She hit the nail right on the head, didn’t she? Success! All of Kristan Higgins’ books are fabulous, with well-developed, smooth-flowing plots and strong characters that make you laugh and cry, but I think this book is the one that must have been in her for years, crying and pushing to get out. She tells the story of Emerson, Marley, and Georgia from their perspectives, and that works perfectly. The story is full of complex characters, a multi-layered, interwoven plot, with so much happening in the lives of lots all the characters, not just these three women. The bad characters are so bad you want to shake them. And the good characters are so good you just want to say, “Come here, honey,” and hold them. Marley’s family is strong and wonderful, but even with their love and support, which she doesn’t doubt for a second, her weight still defines her, makes her see limitations and a reality that may or may not be there. Georgia’s family is so-so. Or let’s just say that many of them are her biggest fans, but a couple of them are so & so’s, hateful and hurtful. The bad seeds in her family have made her doubt and second guess and always expect the worse, to believe she’s never going to be deserving or good enough. And there’s Emerson. It’s not a spoiler to say that Emerson dies early in the book, although I couldn’t believe I was full-on crying in Chapter 2, especially after just learning that Other Emerson’s boyfriend is Idris Elba (and why am I not surprised at that??). Emerson’s story is heart-breaking. We are sad and sorry for her right from the start. But as the book continues, we learn how strong she really was. And wish we could have known her. Could know all three of them. But maybe we do – they are us, aren’t they? I want to be best friends with all these women. I want to hang out with someone like Georgia, who thinks about Beck, “His skin color was Gollumesque.” Now there’s a mental picture that won’t be leaving soon, will it? And her reaction when meeting Rafael, “What if I went into a fugue state and humped his leg?” Another mental picture that won’t leave you soon, but you sure won’t be thinking of Gollum. Or Marley, who reflected, “Camden attracted women like a rotting corpse attracted flies.” I loved this book. I want to start from the beginning and read it straight through again. And I might as well, because I keep re-reading “the good parts” which really amounts to the same thing. It’s all good parts. 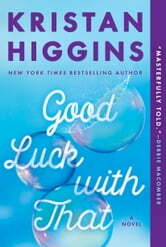 Thanks to Goodreads for giving me an advanced copy of Good Luck with That, and to Kristan Higgins for writing. Never stop. I was not required to write a review, and all opinions are my own. Now please excuse me, I’m going to check off some items on my “When We’ll Do When We’re Skinny” list. I really believe every single person should read this book. On the surface, this book may seem to be about women's weight issues and their self-esteem tied to their weight, but the real power of the book is in teaching empathy towards others and acceptance. Empathy towards others, whether because of their weight issues (underweight isn't excluded), their family problems, mental health issues or the millions of other problems that the individual people of the world have--acceptance of people just the way they are. In Good Luck with That, Ms. Higgins tackles the lives of three friends who are all overweight to different degrees. She throws light on their inability to accept themselves as they are, but also their inability to accept love as they are (how could anyone possibly love them?). Judgement comes not only from strangers, but also coworkers and family members. I'm very happy to say that she threw in a scrawny teenager that has his own issues of not measuring up, being judged, ridiculed and not being accepted. I was that kid growing up and it wasn't a cake walk, either. I really wasn't sure how Ms. Higgins was going to bring a satisfactory end to this book, but she did. There was no magic wand waving. The resolutions came with much angst for some, but they did come... after enduring pain and dealing with themselves and others in an honest way. I will always treasure this book and read it often when I need a refresher course in humanity. Thank you, Ms. Higgins! Beautiful story. Had me crying and laughing. All of Kristan Higgins book are beautiful stories but this one was exceptional. I love a beautiful story of friendship and family. Well done. This book grabbed my heart from the start. I cried for Emmerson, worried for Georgia and wished to be Marley. As a big girl myself, I was impressed with how accurate Kirstin was with many of the thoughts that a big girl lives with. And she also made me realise that other people probably aren't thinking as much about me or my weight as I give them credit for. I'll be reading this one again and again! Thank you Kristan Higgins for one of the best reads I've had in ages!